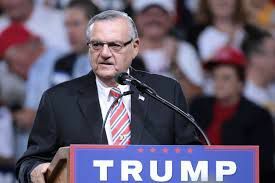 Convicted racial profiler and Trump BFF , fired Sheriff Joe Arpaio , is running around spreading lies about Obama ( again). This is great timing least we all forget that racism has a marketplace in politics and that even the college educated are susceptible to it. The Atlantic has the breakdown.